Despite economic and political challenges in the region, Europe's travel market continues to expand. Gross travel bookings grew 2% in 2018, with most supplier segments projected to notch at least modest gains, according to Phocuswright's recent travel research. Online bookings are advancing faster than the overall market with most of the online growth coming from suppliers' and OTAs' mobile platforms. Register through 15 February to save €500 off final Phocuswright Europe ticket pricing. Travel companies in Europe are clamoring for their share in the growing online market. Phocuswright analysts are keeping their eye on the online-booking battle between suppliers and OTAs (spoiler alert: the suppliers are winning, for now). Among OTAs, the gulf between the leaders and the rest of the pack is widening. 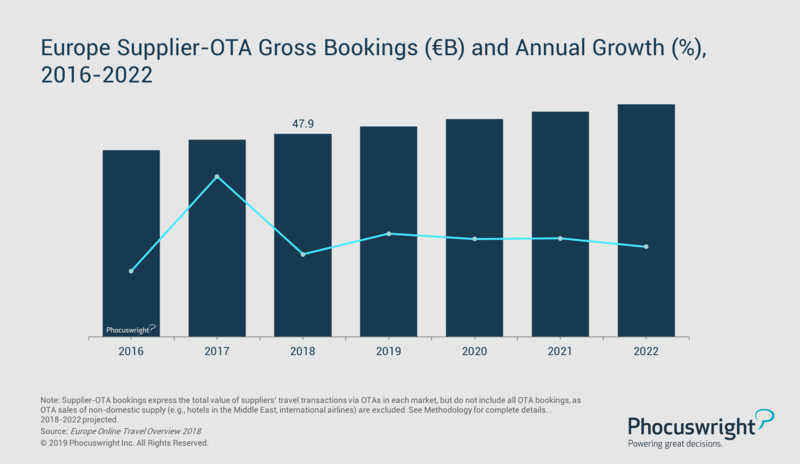 OTAs have been instrumental in the maturation of the region's online travel marketplace, but in 2019, just one or two players are competing for the majority of the €47.9 billion in supplier-OTA bookings. The aforementioned online growth in OTAs' mobile platforms will make this specific channel the booking method of choice for over a third of European supplier-OTA bookings by 2022. Historically, OTAs have focused more on technology than have travel suppliers, and it is critical for them to maintain this focus to remain competitive with online direct bookings in some segments. This is particularly true with respect to the high-growth mobile channel. What technologies and investments will be top of mind for travel executives in 2019? With extraordinary room for growth in Europe's (online) travel market, companies will look to refine their growth strategies around consumer behavior and segment-specific maneuvers. Attend Phocuswright Europe (15-16 May in Amsterdam) to discuss and debate these strategies with industry executives and stakeholders. We'll cover topics such as market forecasts, deep-dives into major travel supplier segments, consumer behavior and data, regional challenges, booking and marketing technologies, and much more. Register today to join travel's smartest and most influential leaders for networking, research and data, innovation, partnerships and more. Get your ticket early for best pricing. Get a sneak peek at the 2019 speaker lineup here.